DomainPatrol Social 2.0 and summer offer! As previous announced, me, Ulf and Fredrik will tomorrow travel to Zürich to be sponsors and exhibitors at the conference Social Connections. As always, we will focus on meeting as many customers and partners as possible, to discuss potential collaborations regarding Social Business and furthermost DomainPatrol Social. Please contact us if you will attend the conference, so we can arrange to meet in person. In the exhibitors showcase, we will demo our next release of DomainPatrol Social 2.0 with support for IBM Connections 4.0 and 4.5. Exciting days for us! 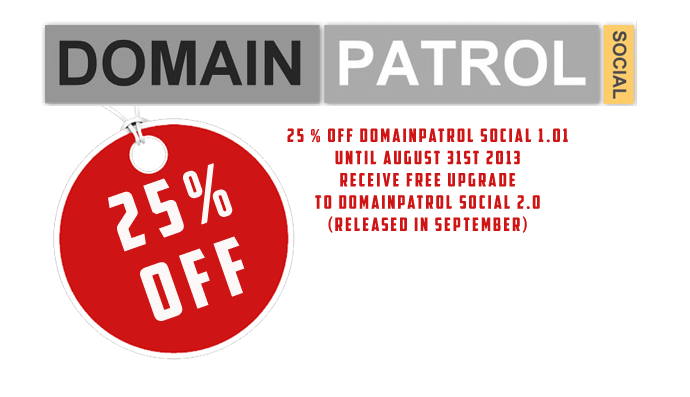 To celebrate this we want to give you 25% off DomainPatrol 1.01 when you purchase on or before 31st of August 2013. You will then receive free upgrade to DomainPatrol Social 2.0 when released. DomainPatrol Social sales team wishes you a fantastic summer!